The centre is led by Training Office Manager Sandro Necchi, who can draw upon over thirty years experience of the valve and actuation industry to assist him with the development of appropriate training programmes. Sandro had worked in sales management for twenty years at a number of leading valvemakers before joining Rotork Fluid Systems as Sales Office Manager in 1995. He is supported by Training Officer Francesco Graziani, who has worked for Rotork Fluid Systems for seven years in the Assembly, Service and Quality departments. Training programmes cover a number of disciplines. Product training is designed for customers as well as Rotork sales and management staff, with the aim of increasing knowledge and awareness of Rotork’s range of fluid power valve actuators and control systems. Service Engineering training courses include actuator assembly and disassembly, manual overrides, trouble shooting, pneumatic control systems and associated equipment. Global Quotation Programme training courses are based on the GQP, which is a specialised quotation tool for internal sales staff, designed to streamline, speed up and standardise the quotation process and methods for the worldwide network of Rotork Fluid Systems sales centres. In addition to the above, further training sessions are custom-designed for specific user or Rotork staff requirements, drawing on the broad technical expertise and commercial experience of the training team. After each session participants are given a Certificate of Attendance. Questionnaires and feedback are utilised to measure the effectiveness of the training and enhance the benefits of the programmes. 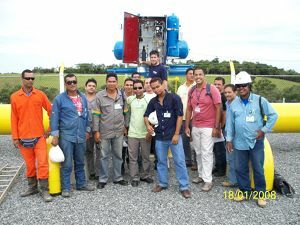 Over one hundred participants have completed training programmes in 2008, including staff from the Brazilian oil company Petrobras, pictured here. Building on this success, the Training Centre will be further developed in 2009.